The themes outlined for WordPress 4.9 are “editing code, managing plugins and themes, a user-centric way to customize a site, and polishing some recently added features over this last year.” Within the themes of editing code and polishing recent features, we’re improving the code editing functionality in the Customizer’s Additional CSS feature, the Custom HTML widget, and the Plugin and Theme file editors. We included these improvements to code editing among the 4.9 goals and this release is packed with them. You have probably already used this CodeMirror library a lot online, since it powers the editors in many familiar products and services including Brackets.io, Bitbucket, Chrome’s DevTools, Codepen, Firefox Developer Tools, GitHub, and JSFiddle, among many others. In the WordPress world specifically CodeMirror is also very familiar. 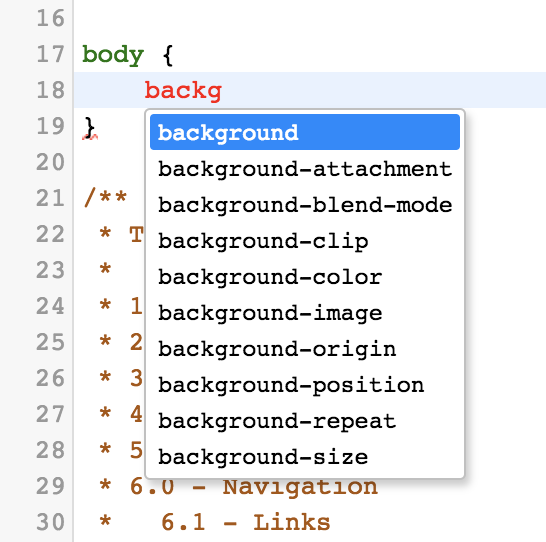 Jetpack switched from ACE to CodeMirror in 2013 for its Custom CSS module, and there are close to 100 search results for CodeMirror on the plugin directory. Many of them should be updated to re-use CodeMirror as bundled with core as well. See below for some details on how to do that. The syntax highlighting abilities of CodeMirror can help authors catch many mistakes visually while writing code, as the color coding can quickly clue in that something isn’t right. In addition to color coding, WordPress also enables by default the add-ons which will auto-close brackets and tags, and then also highlight matching braces and tags which have already been written. 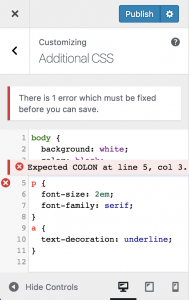 When a linter finds an error in your code (CSS, HTML, JS, or JSON) the code editor in WordPress will prompt you to fix the error before allowing you to proceed with saving. The nature of this error notice varies by whether the code editor is in Custom CSS control, Custom HTML widget, or the file editor. There is still room for improvement with auto-completion (see #42213), but the feature does help suggest possibilities when you generally have an idea of what you’re wanting to enter. Selects the way CodeMirror handles input and focus. The core library defines the "textarea" and "contenteditable" input models. On mobile browsers, the default is "contenteditable". On desktop browsers, the default is "textarea". Support for IME and screen readers is better in the "contenteditable" model. The intention is to make it the default on modern desktop browsers in the future. The code editor in WordPress goes ahead and explicitly defines contenteditable as being the default for both desktop and mobile due to better accessibility. Nevertheless, since there are still accessibility concerns we decided to not yet integrate CodeMirror in the post editor’s Text tab; as CodeMirror is enabled by default it could impede users of screen readers from performing the primary writing workflow upon upgrading to 4.9. Additionally, it doesn’t make sense to work on integrating CodeMirror in the post editor since it is being heavily revamped right now in Gutenberg; we should instead focus on integrating CodeMirror into Gutenberg itself. 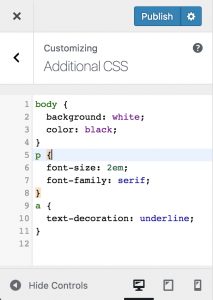 When the Additional CSS feature was introduced in 4.7, it used a plain textarea to edit the CSS code in the Customizer. For several years prior, Jetpack had already featured a Custom CSS module but it allowed CSS to be edited via a CodeMirror editor on an Edit CSS admin screen. After 4.7 was released, Jetpack was updated to use Additional CSS in the Customizer instead, but enhanced it with the CodeMirror editor it had used on its Edit CSS admin screen. So now in WordPress 4.9, core is following suit and integrating CodeMirror into the Additional CSS feature as well (#38707), and there’s now an issue for Jetpack to newly re-use CodeMirror as bundled in core. One key improvement from the initial implementation of Additional CSS is in regards to the detection of syntax errors. In 4.7 the error detection logic merely checked to make sure that the number of braces, brackets, and parentheses were balanced. This was not ideal because there were false positives when a balancing character was present in a comment (e.g. #39198). The goal was to eventually harden validation of CSS syntax validity by utilizing a tokenizer/parser (#39218). Instead of having to implement this logic in PHP, however, we now rely on client-side logic via CodeMirror and CSSLint to check for CSS errors and the unreliable server-side validation has been removed. As when the Additional CSS feature was first introduced as being extensible, the updates feature new extensibility as well. When the feature was under development in 4.7 we debated whether or not to add a reusable code editor control for the Customizer. At that time we decided to opt for a regular textarea control with some enhancements since there wasn’t enough unique about the code editor to justify a separate control at that time. With the availability of CodeMirror, however, there is now justification for a reusable code editor Customizer control (#41897). This control is what is used to power the Additional CSS editor. The code editor control may be registered in PHP via instantiating the WP_Customize_Code_Editor_Control class as can be seen in core. It allows you to pass a code_type param to indicate the file type being edited. Alternatively, an editor_settings array param may be passed which is the same format the new wp_enqueue_code_editor() function accepts (described below). lint: false, // CSSLint doesn't like SCSS. // toggled when lint option changes. In WordPress 4.8.1 a dedicated Custom HTML widget was introduced in order to take over the role the Text widget had for adding arbitrary markup to sidebars, as the Text widget in 4.8 featured the TinyMCE visual editor. This new Custom HTML widget was introduced as essentially a clone of the old Text widget, aside from the absence of the “automatically add paragraphs” checkbox. Well now in WordPress 4.9 the Custom HTML widget comes into its own as it also now incorporates CodeMirror to provide users with syntax highlighting, auto-completion, and error checking. As with the Additional CSS feature, if you make a coding error in the Custom HTML widget, you will be blocked from saving until you fix the error. This guards against a misplaced div tag from breaking your site’s entire layout. On multisite installs or any site on which an admin user lacks the unfiltered_html capability, there are restrictions for what HTML a user can provide in post content, Text widgets, and Custom HTML widgets alike. In 4.8.1 we resorted to listing out some common tags that would be illegal when a user cannot do unfiltered_html. With CodeMirror, however, this is greatly improved due to its integration with HTMLHint and because it is extensible to allow custom rules to be added. There is now a custom kses rule for HTMLHint (htmlhint-kses.js) which checks HTML for any tags or attributes that are not returned by wp_kses_allowed_html( 'post' ). This means that we don’t need to tell users what they can’t do if they have no intention of doing it in the first place, and HTMLHint provides contextual inline error reporting when they do provide something invalid. Plus, since saving is blocked when there are errors, a user’s illegal HTML will not be silently stripped from them when they attempt to save (as wp_kses_post() is still applied on the content when saving on the server). Just as CodeMirror has been integrated into the Custom HTML widget, once 4.9 is released a logical next step would then be to integrate CodeMirror into Gutenberg’s Custom HTML block, as per PR comment. Similarly, once CodeMirror is available in core it can then be explored for use in Gutenberg’s Text view (see issue). Now, about those theme and plugin editors. 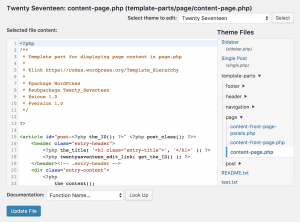 The file editor in WordPress has been the subject of much debate and skepticism over the years. This may be also why hasn’t received a lot of love in terms of improvements. For reasons why the file editor is still a valuable part of WordPress in its mission to democratize publishing, please see @melchoyce‘s post “From No Code to Pro Code”. She goes on to outline a few ways that the file editor can be improved and in WordPress 4.9 almost all of them have been implemented and beyond. Notice how the theme editor has a link directing a user to the Additional CSS feature in the Customizer. It is the hope that CodeMirror will be primarily used in Additional CSS and the Custom HTML widget, but for users who do need to make theme and plugin changes the editors have been vastly improved. When editing PHP files, however, client-side linting is not enough (though it would be a nice enhancement, see #41873). If attempting to call an undefined function this will not be a syntax error, but it will cause a fatal error and whitescreen your site. The plugin editor did previously have some basic safeguards for this by temporarily deactivating the plugin and then re-activating it in a sandbox to check for fatal errors, though it was not very reliable (see #39766). And even when it was able to check for errors, a fatal error would result in the plugin being deactivated, a plugin which could be critical to a site to function properly. For themes on the other hand, there was no such ability to temporarily deactivate the theme and do a sandboxed check for fatal errors since a theme cannot be deactivated like a plugin can. 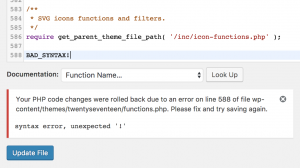 Ultimately what was worked out in #21622 was a new sandboxed method for making PHP file changes in both plugins and themes. When attempting to save a PHP file edit for a plugin or theme, during the user’s save request WordPress will write the file to disk after first copying the old file’s contents into a variable. Then immediately after writing the change it will do a loopback request back to the file editor screen with the user’s same cookies to check to see if the PHP file edit would lock them out of the editor. If that loopback request generates a PHP fatal error, then the original PHP file is restored. Otherwise, if there is no fatal error then WordPress will open another loopback request to the homepage of the site to check if there is a fatal error generated there. If so, again, the PHP file edit is undone with the old version of the file restored. At that point, an error message is shown to the user informing them of what specifically the error was and prompting them to fix it. The user’s modifications to the PHP file remain in the editor for them to fix (also these save requests now happen over Ajax so the user never leaves the page). 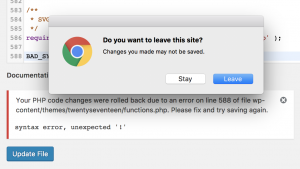 If they try leaving the page without fixing the error and successfully re-saving, they’ll get an “Are you sure?” dialog informing them they would lose their changes, in the same way as leaving the Customizer or the Add New Post screen. If the loopback requests aren’t able to complete, the file edits will also be reverted and the user will be prompted to use SFTP to edit the file. The Customizer code editor control, Custom HTML widget, and file editor all make use of an underlying “code editor” API that provides an abstraction on top of CodeMirror. In PHP there is the wp_enqueue_code_editor() function which is named and functionally similar to wp_enqueue_editor() for TinyMCE. The wp_enqueue_code_editor() function takes an array of args, including the ability to specify the file type that you intend to edit, or else the file name itself. Alternatively, you can pass a codemirror array arg that has the same structure as what you would pass when initializing CodeMirror in JS. Then depending on the language mode that is either explicitly provided via codemirror arg or which is deduced from the file or type args, the function will specify various defaults depending on the selected mode. For example, if editing CSS then it will enable linting and if editing HTML it will enable the auto-closing of tags. Once the settings array is fully assembled it is then passed into a wp_code_editor_settings filter to give plugins a chance to further modify the settings. If this filter returns false or if the user had previously disabled the syntax highlighting preference, then the function will return false and no scripts will be enqueued. Otherwise, the function will proceed to then enqueue the code-editor script and style along with the wp-codemirror script/style dependencies and then any supporting linter scripts. The wp_enqueue_code_editor() function will exported its settings array to wp.codeEditor.defaultSettings in JS while also returning it to that a feature can directly pass it into the wp.codeEditor.initialize() API. This initialize method is modeled after CodeMirror.fromTextArea() in that it takes a textarea object or ID as its first argument and then the settings as its second. In addition to the settings exported from wp_qneueue_code_editor() the settings passed into the initialize method can also include several callbacks including onChangeLintingErrors, onUpdateErrorNotice, onTabPrevious, onTabNext. These callbacks are what the various integrations rely on to manage the displaying of linting errors as well as ensuring keyboard navigation. // Enqueue code editor and settings for manipulating HTML. // Bail if user disabled CodeMirror. The integration of CodeMirror into core was initially worked on in the Better Code Editing feature plugin on GitHub. A full development history can be found there in the issues, pull requests, and commit log. The principal contributors to code editing in this release were @afercia, @helen, @georgestephanis, @obenland, @melchoyce, @westonruter, and @WraithKenny. #41887: Code Editor: Error disables the Update File button. How reusable is the “Heads up” modal code? We could use a custom, accessible modal for things like #20578. @swissspidy It wasn’t designed to me reusable since there wasn’t another use case in mind, so if you would like to generalize it to be used in multiple places that would be great. The Additional CSS Integration now looks really interesting – I can imagine people using this to tweak their CSS and see the resulting change . But unfortunately it remains virtually unusable, in my opinion, due to the extremely limited width available even on Desktop. I’ve got a acre of screen width available & I so want to grab that Customizer border and drag it a bit to the right. @buzztone We’re looking at adding a “pop out” feature in #38707. Also, CodeMirror does support a fullscreen mode that could be used here. Lastly, there is a feature plugin for changing the width of the Customizer sidebar in Customize Pane Resizer feature plugin. It needs some testing for 4.9 compatibility. Can we get the customizer pane resizer added in next release? @Weston Ruter Customize Pane Resizer is pretty much exactly what I was looking for. Is there a Github repo for this feature plugin? Pull requests welcome and appreciated! @westonruter When I add 'code-editor' to the 'post' screen’s 'content' box (using your User-profile bio script above), the left-gutter (lint and line-numbers) covers the content, and there’s no way to scroll the content horizontally into view. Any way to quick fix? @hearvox Please share the code you’re using to add the code editor. So this wasn’t a use case we specifically developed the wp.codeEditor for. And actually, the real culprit is probably actually the post content editor JS not the code editor JS. Long story short, to convert the post content editor’s textarea into a CodeMirror editor, my current recommendation is to directly use core’s wp-codemirror script, to not to use the code-editor abstraction, but rather create a custom integration with the post editor. Thanks, @westonruter. Makes sense to wait till Gutenberg. But I do hope the Post screen’s text editor get syntax colors someday. 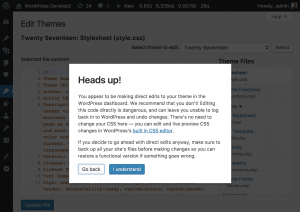 Editing theme/plugin/css files in the WP Dashboard is a fairly rare event in a site’s lifetime. While writing HTML in the WP post editor is happening right now many thousands of times across the planet. I’ve experimented with some plugins but they’re too quirky to unleash on the sites I work on (mostly journalism sites). Most journalists can handle some HTML, and syntax coloring would make it even more handleable, but not if the price is a quirky editor. Someday. Thanks for all your work (loving Customize Posts plug), hope that gets core-d one of these days. I’d second this. I know it’s subjective and will vary from one site to the next, but being able to use this kind of html editing functionality within the post editor would be my number one desire for WP. So here’s an issue I’m noticing using the wp.CodeMirror global. If you use CodeMirror addon’s they expect there to be an unprefixed CoreMirror global available, so they obviously don’t work and trigger an error. An obvious fix would be to re-assign wp.CodeMirror to CodeMirror, but then you’d run into potential conflicts down the line. I guess what’s missing is an extensions API to the core implementation of CodeMirror. First, however, do note that the show-hint addon is already part of the bundle, so you don’t need to enqueue it yourself. See the full list of modules that were included in the wp-codemirror script bundle. Not pretty but it should work… most of the time. Otherwise, the recommended route would be to incorporate the desired addons as part of a build which would define CodeMirror in the scope of the bundle. This should be pretty straightforward to do with Browserify or Webpack. This is what we did in the first place to export the library as wp.CodeMirror instead of CodeMirror. @westonruter Ah cool! that’s kind of what I meant in my earlier question about which parts of CodeMirror were bundled in. Good to see most of what I need is in there. Yeah, I think a custom bundle ala WordPress core is what I’ll do going forward. 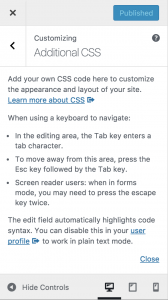 It seems that any additional styles added to existing theme/child theme external style sheets after upgrading to WP 4.9 are no longer recognized, which forces us to use the “Additional CSS” feature in the Dashboard. The page still reflects pre-upgrade styles from the external style.css but any new/added styles will not show on the page. I prefer to work on my external style sheets! Is there any way we can still do that – or are we forced now to use the built in css feature? @Riavon There should be no change to styles added to your theme or child theme via the theme editor. Are you seeing a caching problem? You may need to do a hard refresh to see CSS file edits from your theme. Using the Additional CSS feature is not required, but it is recommended. I’m a pro. I don’t use the theme editor in the Dashboard to write my CSS. And I know that clearing the cache is the first line of defense. I’ve built and launched hundreds of WP sites, have worked with WP for 10+ years. I’m developing a new site locally using a child theme of Generate Press which I’ve built several sites with already, and before I posted here I ran all the tests. I prefer to continue development of this site using the external style sheet I started with before I did the upgrade to 4.9, but it’s not possible because of what I stated in my original post. For the record, I rolled back to 4.83 and everything is back to working just fine: any and all additions and changes added to the existing style sheet are showing on the page just fine. There is some bug with 4.9 that is disabling the ability for changes/additions made to the external style sheet from being reflected on the site. @Riavon ok, great. Since you are experienced would you please identify where the defect is in relation to the code you are working with and open a Trac ticket? I’ve not seen problems related to what you have described, neither have I seen any reports similar to yours. So your help in identifying the problem will be key. Thanks! I’m finding that the CSS editor in my Child Themes for Studiopress no longer works well at all. Developing sites and now cannot search for items unless it is visible in the current screen, can’t select all except for what is visible on current screen an no CSS updates are being recorded even if I clear my cache. Also massive conflict with Visual Composer but that’s for them to sort I guess! Rolled back so I can carry on building my sites! @estherrosie Have you tried turning off syntax highlighting via your user profile? If that improves things then that isolates the issue to CodeMirror. Thanks for quick reply Weston. Yes this has worked and also, so far, looks to have solved the VC not saving or loading prebuilt templates issue. @estherrosie I suggest opening an issue with Visual Composer for them to investigate an incompatibility with core. There may be a copy of CodeMirror in VC that is being used in a conflicting way with what is being done in core. Very please with the huge improvement in the code editor. Really helpfull for quick and on the go amendments of the stylesheet (among other) as the previous text editor was a nightmare to use. Love the updates. Is there any update on getting these to Text Editor of Posts & pages ? 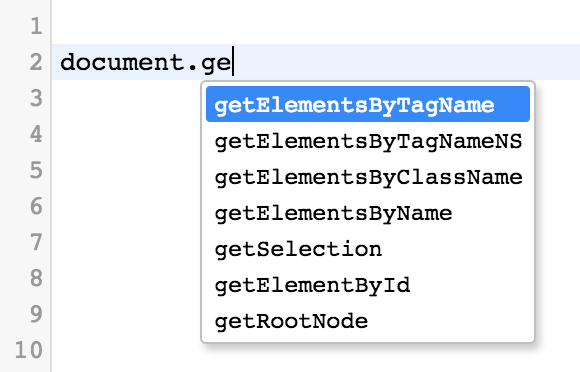 HTML tags in text editor adds too much p tags & breaks which is weird. Can CodeMirror themes be added by a plugin? Where would I find docs on the Code Editor API? @dnavarrojr This dev note is the docs. What info do you need?